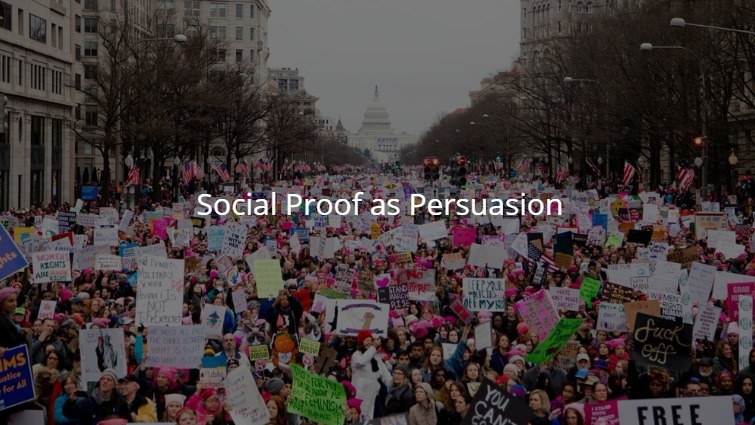 The persuasion technique social proof is most often used in ads and also political campaign. It is a very effective technique to persuade, so if you want to persuade successfully, consider this technique. It means, if you want to persuade someone to follow what you want, show that many people include celebrity, film star, public figure follow your recommendation. Social proof is one of 6 technique persuasion by Robert Cialdini. Beside persuasion technique social proof Another technique is Reciprocity, consistency, scarcity, liking, and authority. Robert Cialdini uses the term social proof or consensus… The purpose of consensus as a factor of persuasion is that we tend to believe in something popular, many people wear or supported by people we trust. This technique is used by new food stalls by inviting a free meal at the restaurant, so the stall is crowded. People who do not know will be encouraged to participate in the restaurant. In advertising, this technique is used by using film stars, public figures, expert doctors. In addition, this technique is also used by way of example, 5000 people entrust their beauty in this product. We tend to believe that celebrity has a good taste to select cosmetic and products. So if some products chosen by celebrity, we think it is good and worth to by. it, the softy star of the soap opera wear it, a lot of positive comments, comments from close people give a good impression. We believe that a product is good if the proficient person uses. So, many experts like people show in the ads. In the last time about 1950, many doctors used in the cigarette advertising to show that cigarette is good for health. We tend to believe that if many people use products, it means good products. If you go the strange city, and there are many options of the restaurant. You want to eat in one of them. You didn’t know which restaurant that suit and good for your taste.